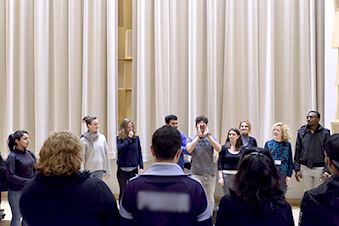 Friends and Patrons of the SNFCC (F&P of the SNFCC) support the Greek National Opera (GNO) by sponsoring the transfer of the members of the Cross Cultural Choir, for the Spring program of 2018, as part of the Social and Educational Programs of the GNO. The Cross-Cultural Choir started as an initiative of the Alternative Stage of the Greek National Opera in December 2016. It takes place under the auspices of the Alternative Stage in cooperation with the Educational and Social Activities of the GNO. It is targeted to permanent or temporary citizens of Athens, adults, immigrants, refugees and nationals and aims to spread the joy of singing. Its members come from all over the world, ranging from Iran, Slovakia, New Guinea, Syria, Cyprus, the United Kingdom, Ukraine, Afghanistan, Cameroon, Greece and other countries. Its broad cultural diversity allows for the equitable exchange of a musical repertoire among its members, while at the same time constitutes a setting for the creative learning of the Greek language, expression, and networking of the participants by combining traditional songs from the native countries of its members with the classical choir repertoire. Having secured easy and free of charge transport to and from the SNFCC for its members is of paramount importance, as it assists and enhances the regular participation in the program, since using public transport is not always possible or in some cases very time consuming. Recognizing the value of the social program and supporting the smooth operation through the regular participation of its members, F&P of the SNFCC have secured the funding for the participants with a 50-seat bus, departing from the center of Athens to the SNFCC – and vice-versa. This transport will occur on a weekly basis, based on the needs of the members of Cross Cultural Choir, between February and June 2018. 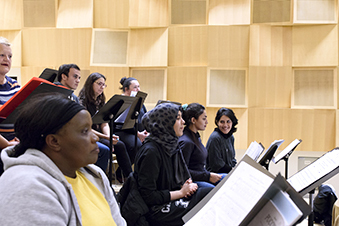 The meetings of the Cross Cultural Choir will take place in the Choir Hall of the GNO at the SNFCC every Monday between 18:00 and 20:00. For more information on the Cross Cultural Choir, please visit the website of the Greek National Opera.